We decided on pasta last night but wanted to try a new recipe. Typing “pasta” into the search box on Epicurious yields overwhelming results so in order to focus us a bit more, I gave Brandon The Gourmet Cookbook to browse through. He came up with a Penne with Arugula and Prosciutto that sounded great and featured a 20 minute start to finish time. This was perfect since we weren’t able to start on dinner until after 8 p.m.
We made a few modifications to the original recipe. The biggest was the addition of shrimp which we both agreed really took the dish up a notch. Overall, this is a very simple recipe but each element plays a big part in the flavor, especially the arugula. Don’t skip it. While the pasta was boiling, I sauteed the shrimp in olive oil with a little bit of a lemon pepper rub (Dizzy Pig Shakin’ the Tree). Once the pasta and shrimp were done, I drained the pasta and dumped all the ingredients into the pot with the pasta. After a stir and a generous crank of salt and pepper it was time to eat. I served this dish with a hunk of bread and olive oil dipping sauce. At one point I said, “Mmm…I love carbs.” aloud. We’re happy to have another pasta dish worth repeating (over and over again) in our repertoire! 1/2 pound pasta (half box) pasta, penne, corkscrew, etc. Cook pasta in a large pot of boiling salted water according to package directions. Reserve 1/2 cup cooking water and drain pasta. 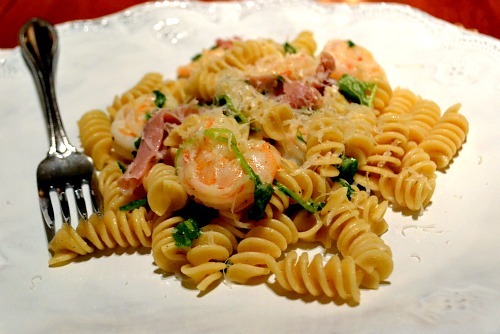 While pasta is cooking, sautee shrimp over medium high heat with olive oil and seasoning of your choice. This should take about 3-4 minutes, total. 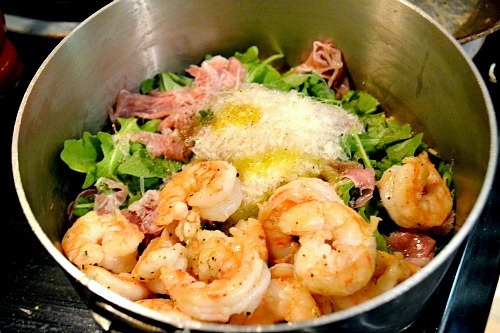 Return pasta to pot and toss with prosciutto, shrimp, arugula, cheese, lemon zest, lemon juice and salt and pepper to taste. Add some of the pasta water if it seems dry.